Messrs Thielman and Struve took a party of Beecher Citizens over to Crown Point, Ind. Monday, in their automobiles to visit the new mausoleum which was dedicated a couple of weeks ago. The personnel of Mr. Thielman’s automobile were besides himself and son, Harry, Messrs W.F. Myrick, William Bielfeldt and D.J. Steevens. Mr. Struve had as his guests Ferdinand Oberheider and family. The ride was a most pleasant one, especially on the Indiana side from New Brunswick to Crown Point, where the stone roads were traveled. The dirt roads were in normal conditions, and we could readily see the superiority of the stone roads. After reaching Crown Point, which is a beautiful little city, the party was taken to the cemetery and shown the beautiful new mausoleum, which was dedicated on May 19. The building is a handsome structure built of cement blocks, and contains 240 crypts. The crypts are all of cement with marble facing and marble slabs for openings. The floor is of tile, while the ceilings are handsomely finished and frescoed, bearing paintings of angels and giving the interior a church-like appearance. 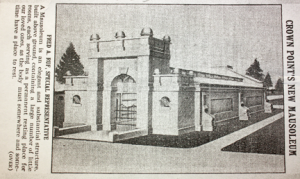 That the citizens of Crown Point are in hearty accord with the mausoleum idea of burial, is not only evidenced by this structure alone, as we noticed three or four individual vaults erected in other parts if the cemetery – one by a manufacturer of cement vaults which are placed in the ground, such as are used so generally in Beecher Cemeteries – and for the construction of which he paid some $3,500. Fourteen crypts are already occupied in the new mausoleum, according to the sexton, who is also an ardent mausoleum enthusiast. Each of these crypts bears the inscription on the marble plate of the name and dates of birth and death, etc., of the deceased, and as all crypts are uniform it would be difficult for a stranger to ascertain as to their social or financial standing, all being buried, rich and poor alike. In front of each crypt, and projecting out from the marble plate is a ledge or shelf of marble upon which can be placed bouquets of flowers, which are cared for by the attendant and are kept fresh for several days. The company making the visit were mutually favorable impressed with the mausoleum idea and the promoters can feel assured they have added some more enthusiasts who will speak volumes of praise for this sanitary mode of burial. 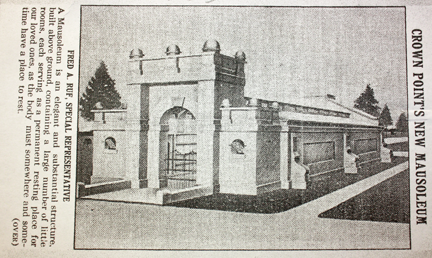 A flyer proposing the building of the Crown Point Mausoleum reads: A Mausoleum is an elegant and substantial structure, built above ground, containing a large number of little rooms, each serving as a permanent resting place for our loved ones, as the body must somewhere and sometime have a place to rest. Our Mausoleum eliminates the horrors of the grave. Here they peacefully rest until the morning of the last day. Calm and peaceful lie the loved ones of entire families. 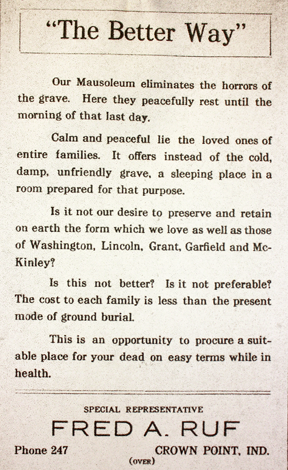 It offers instead of the cold, damp, unfriendly grave, a sleeping place in a room prepared for that purpose. Is it not our desire to preserve and retain on earth the form which we love as well as those of Washington, Lincoln, Grant, Garfield and McKinley? Is this not better? Is it not preferable? 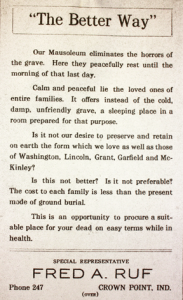 The cost to each family is less than the present mode of ground burial. This opportunity to procure a suitable place for your dead on easy terms while in health. 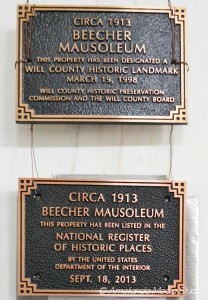 Two People from the Crown Point Mausoleum were moved into Beecher’s Mausoleum around the same time.